Instant Imprints Guelph, ON | Custom T-Shirts, Embroidery, Signs & More! 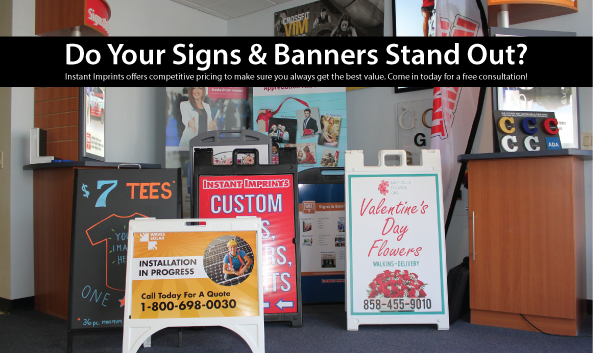 At Instant Imprints Guelph, our customers come to us when they want to be more visible to their customers. We create that visibility five different ways: Branded Apparel (embroidery), Signs & Banners, Promotional Products, Custom T-Shirts and Print Services. If you’re looking to market your business with custom t-shirts, banners, printing services, embroidered apparel or other promotional products, your local Instant Imprints® here in Guelph can provide you with the tools to take your brand to the next level. By utilizing the best promotional products around, you can drive brand visibility in a smart, stylish and effective way. We are an all-inclusive service that can take care of everything from initial design to final production, all under one roof. At Instant Imprints, you can have a world-class service with the local touch you’ll find only in Guelph. Our Image Experts strive to help your project reach its full potential, while answering any questions that you may have. Think globally but work locally, here at Instant Imprints in Guelph! All across Ontario and well beyond, you’ve surely noticed that custom t-shirts are a popular form of brand promotion. Virtually any brand, big or small, seems to have a custom t-shirt design out there—it gives customers a chance to show off their style while supporting a brand they love. Wherever your custom tees may travel, your business’ values will be spread around with them. You can use custom t-shirts in giveaways to entice new prospects, or put them up for sale so that loyal customers have a chance to show their support. Our Personalized T-Shirt Service lets you handle any job, whether it be a single personalized shirt or a mass production of a thousand custom tees. You can use your custom tees to promote an upcoming event or celebrate a past one, as well as advertise a new product or your brand as a whole. Whatever your project goals are, our Guelph Image Experts are here to help you take your brand visibility to the next level. Custom signs and banners are a great way to present your brand image to the masses. Whether you’re looking for a sidewalk sign or a building-wide banner, our Image Experts can help you design the ideal marketing product. You can choose from a wide variety of design options, including different materials and finishes, to make a sign or banner that fits your brand’s unique needs. Banners are reusable, easy to transport and highly durable, so that you can make it work for you wherever it’s most effective. Use them indoors or outdoors, as permanent fixtures or temporary highlights. You can invite passersby into your storefront with a personable sidewalk sign, or use a large banner to invite motorists to check you out. The sky’s the limit when it comes to the potential that a banner can bring, so get creative and get your logo out there! At Instant Imprints in Guelph, we adhere by a set of core values that ensure that you have the best experience possible when working with us. We emphasize the importance of getting your job done right the first time and delivered on time or early. By partnering with a professional print shop like ours, you can rest-assured that your product will be of the highest quality, and avoid the costly revisions that home or office printing attempts often bring. Our state-of-the-art production processes paired with the one-on-one attention that you’ll get from our Guelph Image Experts means that your business will be represented in the best possible way. When you stop by your local Instant Imprints Center in Guelph, you’ll be taking a huge leap toward a more visible brand. By only using top-quality promotional materials, your business will be able to shine in the eyes of customers. Our team of Guelph Image Experts are determined to lead your project to success, from the initial planning stages to the final production. You’re sure to capture the attention of passersby when they see your banners or promotional products. Start your journey to a better business by giving us a call at (519) 265-711, requesting a quote online or by coming by our Guelph showroom today!